While getting ready for the E3 Expo I decided to stop by Giant Robot in the Los Angeles Japanese cultural district of Sawtelle. There, Giant Robot Owner/Publisher Eric Nakamura was hosting a show of video game culture influenced art. 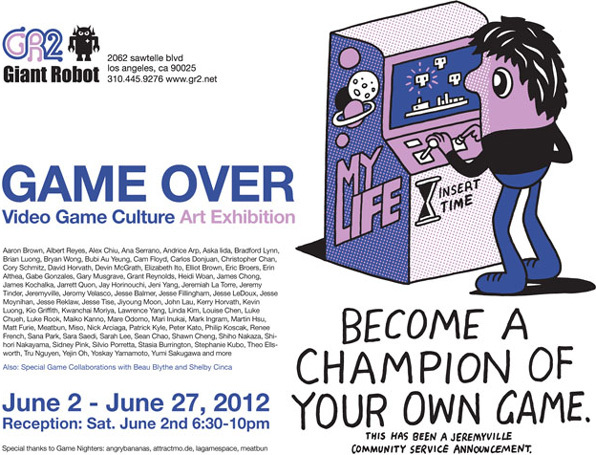 Game Over Art Show runs from June 2nd to June 27, 2012. Location: GR2, 2062 Sawtelle Blvd LA, CA 90025. See some photos from the exhibit after the break. Also there will be playable indie games including the works of programmers Beau Blythe and Shelby Cinca who are creating a game with Sean Chao and Jeni Yang. It’ll be a welcome back to ArtxGames series. See the slide show above for some of the photos I took of the amazing art on show at the event.